Houston, we have a problem. The CMO Trust Gap is real. Many CEO’s have low trust in their CMOs, and very few people trust marketers. As we learned in an interview with Kimberly Whitler and an article from Philip Kotler, there are multiple causes and reasons for the trust deficit. Why do CEOs tend to trust the CFO and CIO and not the CMO? Whitler points out that while CEOs often turn to CMOs when they need to generate growth – setting high expectations for the CMO – they fail to give the CMO commensurate authority. As she explains, the CMO’s job requires multiple functional areas to collaborate and contribute. But growth is not a single-function responsibility. So, CMOs end up in high-influence roles with broad expectations but their authority is limited, creating what she calls a “water-walking” job. This, of course, is a recipe for failure. Too many organizations have designed narrow or fragmented CMO jobs, and as such they are built to fail. CMOs also have the near-impossible job of balancing customer and shareholder needs. Sometimes pricing is a zero-sum game of winners and losers. If marketing cuts prices, the customer wins but the shareholder loses. Marketers usually rely on competitive dynamics to establish “what the market will bear.” But sometimes competitive restraints are weak, and price is regulated more by moral constraint. Last year’s poster child of this dilemma was the Mylan EpiPen, where the company was loudly accused of price gouging. Mylan’s pricing was attacked by Congress, presidential candidates, the media, and the public. Now pension funds want to oust most of Mylan’s board. Another dilemma involves a classic marketing investment tradeoff: Should marketing invest in brand awareness or lead generation? This is a classic problem of weighing long-term versus short-term gains. While attribution models and discounted cash flows can add considerable logic to the discussion, sometimes the proverbial “bird in the hand” is the winning argument for a CEO of a publicly traded company. What is a marketer to do when brand awareness is best evaluated over the long-term? Invent new solutions: No “either/or” thinking; it’s “both/and” on behalf of customers. Think long-term: 5 to 7-year time frames. Be willing to be misunderstood. Most companies, unfortunately, don’t prioritize their strategy or operations this way. But what if they did? 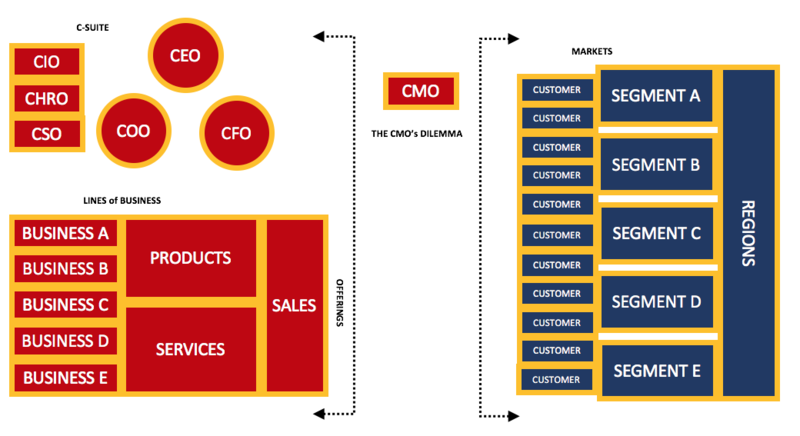 One way to solve the CMO’s dilemma is to organize around the customer. In Rethinking Marketing, Gaurav Bhalla advocates shifting from a product-management-driven to a customer-management driven company. First, define a customer-centric buyer’s journey that parses out the relevant personas and defines the ways customers want to buy. Then, market to them that way, because when you do, you make you make your customers really happy. While your company is a beneficiary if you do this right, you are really doing it on behalf of the buyer. That is true customer-centricity. Companies commonly say they are customer-centric. It is also common for companies to struggle with making the claim a reality. The two most prevalent implementation barriers are decision-making process and organization structure. Every problem should first have a consumer impact analysis before looking at company impact. This principle should apply to every investment proposal that exceeds, say $100,000. We take it for granted that capital projects must be approved by finance. Why isn’t it also taken for granted that a customer impact analysis must precede any significant budget proposal? The second major reason why companies fail to put the customer first is rooted in organization structure. While authority over company finances is easy to identify in all corporate organization charts, bottom-line authority for pleasing the customer tends to be far flung, fragmented, and ambiguous. 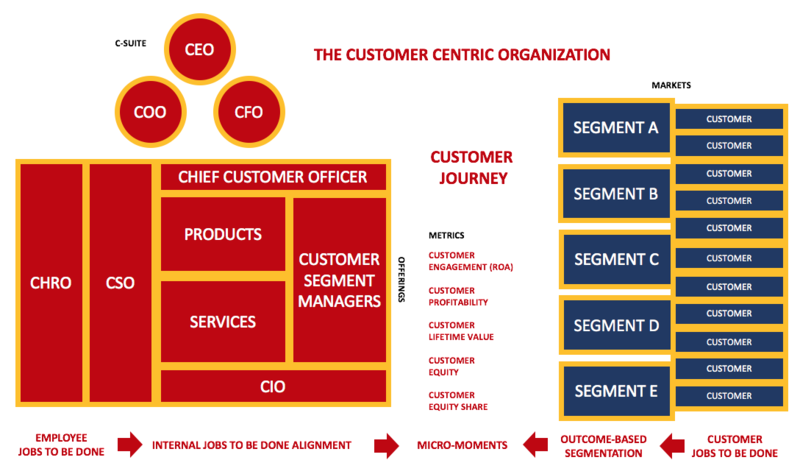 What is needed is a genuinely customer-centric organization, and the key to getting there is creating a Chief Customer Officer (CCO). An example of how to implement the CCO concept is provided in the organization chart below. The CMO is now the Chief Customer Officer (CCO). Before, the CMO was largely focused on managing corporate Marketing Communications (MARCOM). Now the CCO is charged with ensuring that the company puts the customer first and that every major investment is closely tied to serving the customer. Customers are served by customer segment managers whose job is to find the best ways to spend marketing dollars on customer journeys. The research focus is on the customer’s Job to Be Done which in turn leads to outcome-based market segmentation represents a significant leap in customer-centricity. It focuses on real opportunities: measurable activities that are underserved by the competition. Customer Journey Analytics becomes a competitive advantage. Businesses must define, execute and optimize their customer journeys by developing actionable insights from big data and create smarter customer interactions at every point along the customer journey. The buyer’s journey is no longer a linear process. What matters most is that we help customers get the job-done in the micro-moment. Customer equity and customer lifetime value are the core measures of performance. On the internal side, operations are aligned with the employee job to be done. The underlying “Martech 4.0” infrastructure supports the entire customer journey as well. By aligning all hands around the customer journey, the CCO (formerly known as the CMO) is now a key member of the C-Suite. Organizations started touting customer-centricity in the 1990s. True customer-centricity, however, is a challenge not all organizations are ready for. The question at this point is: are there any other viable options that work? We think CMO job fragmentation has run its course as a losing proposition. Now it’s time to restructure the CMO role by returning to its original intent, and enriching it with the organizational authority required to make marketing great again. Kimberly Whitler is a former CMO who has worked both in the U.S. and overseas for a variety of companies, such as P&G, PetSmart, and David’s Bridal. After nearly 20 years in industry, she is currently an Assistant Professor at the University of Virginia’s Darden School of Business, conducting research that addresses contemporary CMO challenges.